Got my birthday money and blew it at Michaels! I can’t wait to make planner and Book of Shadows stuff. Cosmic/starry night/purple is my jam lately. Dark Rainbow is one of my most fave paper stacks ever so I got 2! 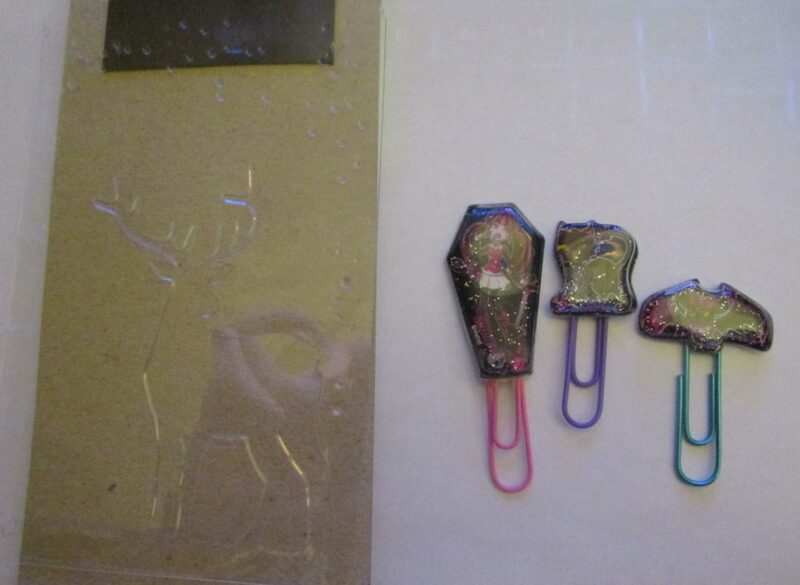 The glossy cosmic cover on the left is a letter sized scrap book I just had to have (it says Don’t Forget to Sparkle). I’m thinking of making it into some sort of BOS project, because 1 (or 5) just isn’t enough for me. There’s also a mermaid/beach stack called Just Beachy (to the left of Dark Rainbow) which was too pretty not to bring home. Chipboard covers and rings (bottom right) are in a 2-pack which just called to be played with. 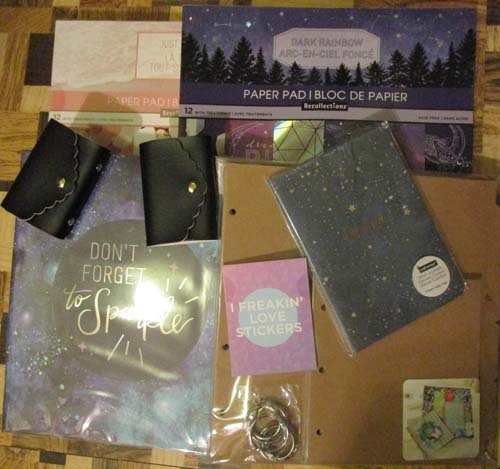 A little fantasy sticker pack called I Freakin’ Love Stickers is near the middle; a starry notebook that says ‘dreamer’ is to the right of that, and a couple sticker wallets (black) with stickers inside are to the left. Not pictured is a tortoiseshell plastic cover notebook from the dollar store, which I got because it reminded me of leopard print. Anyhow, I broke into the paper stacks to molest the prettiness, but the rest will have to wait for now. I have a proofing client this week, now that I’m over pink eye again and can see the damn screen without ice picks seeming to jab my eye. I realized that I accidentally finished the #100DaysOfShenanigans challenge, and I didn’t even stop to celebrate! OMG Below are my several last art projects, and the rest of my #100 days were spent writing and editing my book project currently code named L1. 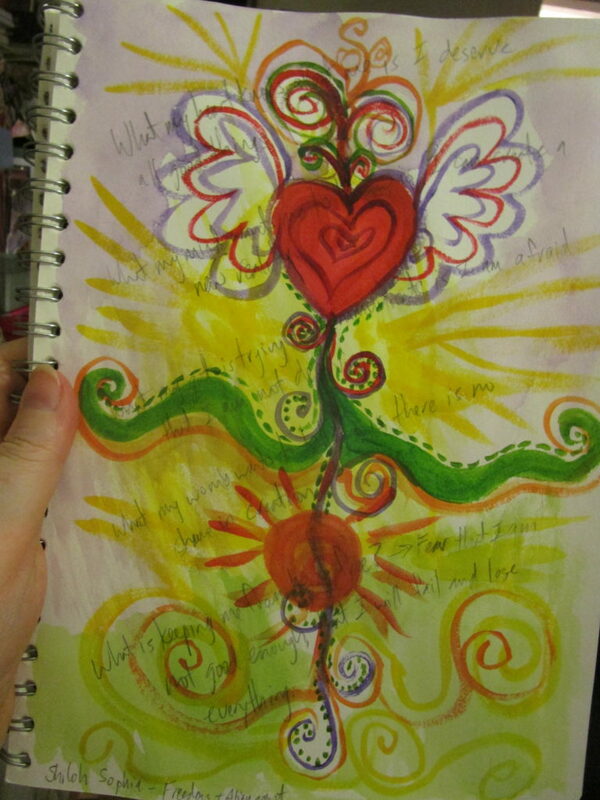 Painting with Shiloh Sophia about messages from your body. 3 days of writing a Christmas story for Phrixy brings me up to Day 87 in #100DaysofShenanigans! It may one day appear in an anthology, as I’m thinking of exploring the winter holidays popular in Lupercalia. We shall see. 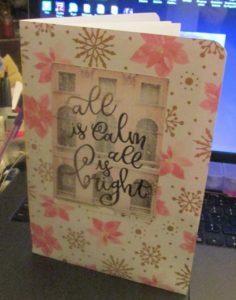 Then some stamping and die cutting brings us to Day 88 on Dec. 25. No pictures, sorry, but I’ll have some next time. 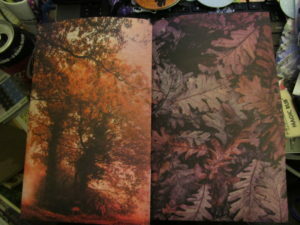 Day 81: The first is a booklet with 20 pages and pockets on the inside of the covers. The cover and pockets are made with a single sheet of 12 x 12″ cardstock. The paper is Sugarblush by Recollections. I’m not normally into pink so much, but I have to confess that my character Jaymi has infected me a little bit. LOL There are some really pretty papers in this collection, including a pink fur texture. 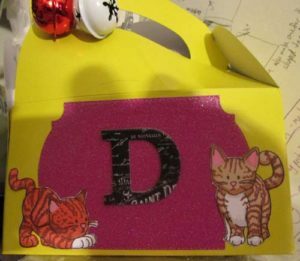 Day 82: Second is a decorated box–I coloured the kitties and diecut the D and the glitter paper fuscia plaque. I have to say, that glitter paper has a sort of coating on it to keep the glitter in, and it’s not so easy to cut with the thinlet dies. The kitties were stamped and then coloured with alcohol markers in colours my friend prefers for cats. 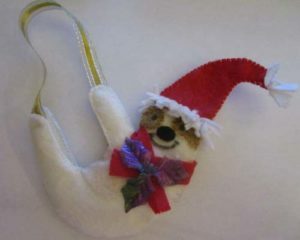 Day 83: Third is a sloth ornament made of felt. It’s based on an image I found online. I just drew it out by hand. I’m not entirely happy with the face, but I didn’t have the right colour of felt to do the eye patches. I’d also have preferred to use a low-pile fur on the hat, but whatever. It’s done and ready to go to its new home. Day 84: And last is a folder in the custom biz planner/workbook I made. This uses the Across the Galaxy paper stack by Recollections, which I love. I made the covers and 4 dividers with folder on the reverse. It’s assembled with MAMBI Happy Planner discs. The covers are laminated, and made a little wide to accommodate the divider tabs. I’ll try to remember to add more photos. The front says Shine like the Stars in gold on navy blue. I’m excited about the Black Dog story, as it has a lot of sadness and conflict that my partner usually has us shy away from in the past. Since this one was mine, I got to do all the horrible things I wanted to, once I had permission to kill someone off. It was sad and difficult, and one day far in the future if I’m ever invited to speak at a writers’ con… if anyone asks about it, I’ll probably cry. 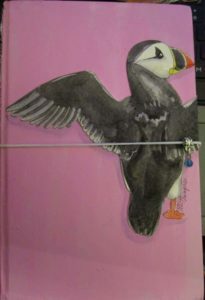 Oh look, I made a travelers notebook with puffins for my mom, in the midst of writing for NaNoWriMo! I didn’t include all the extra goodies I normally would, since my mom’s not a planner gal. 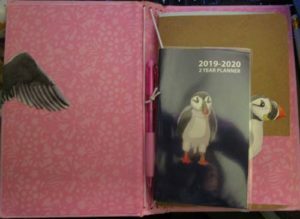 It has the cover with elastics, a folder, a booklet, and a calendar. Since it’s all removable, I wouldn’t be surprised if she just takes out the calendar and throws it in her purse. Can you believe I discovered when I went to paint the cover, I had no good pink paint??? It was dried up dregs. So I’m slowly replacing my old paints as I find out what’s dead. I’ve had some of them like… 20 yrs. It’s not really a surprise. They only had bright fuscia-ish pink, so I had to mix it, and naturally spilled it down my pants and all over some forms on my desk. Go me! The puffin’s wing wraps around to the interior, because I’ve never had a decent sense of scale. Ugh. But I think it’s cute that way. 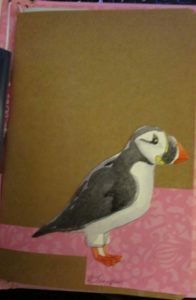 The puffins are all watercolour and pasted on. As you can see, it includes a pink BIC pen, because why not? The booklet has matching papers for accents. I didn’t think to take a picture of the folder. It has a tropical island, because why not? Nov 10th is day 59 of Shenanigans! 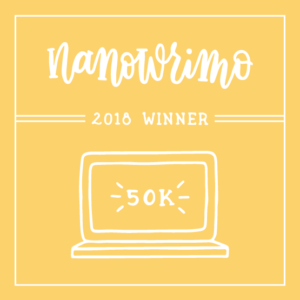 Update: November 5th–I made some cards to add to Mom’s Christmas gift, and I’ve completed 5 days of NaNoWriMo, bringing my #100DaysofShenanigans total to 53. I’m over halfway there! I was invited to join a Facebook group with some writer friends about smashing our limiting beliefs surrounding creativity. So we’ve spent the month noting what they are, how they came about, and so on. Being the list maker I am, I also made strategies for coping or negating them, not just figuring out their opposite or ‘medicine.’ Because I’m into figuring out an action plan, not just placating myself. I am feeling in my power tonight, and ready to take on the world. A friend of mine was very unsupportive about all this the other day when she asked me about it, and in explaining it all, I found myself feeling ferocious and determined and ready to take it all on. Yes, I’m spending this time healing, but I’m also creating the stepping stones to entrepreneurship. I know that as a creative it can take multiple income streams to support oneself, but that doesn’t mean falling back on a ‘day job’ to support the rest. It means working hard and carefully putting things into place so that all the drops collect and fill your bucket. So tonight as I welcome my beloved dead, my ancestors, and those the world has wronged, I also burn my limiting beliefs and step through the fire and into my power. I will not give up. I am strong. I will make this happen. I recognize the amount of work I can handle right now, and I know it is building up to what I need; that is not the same thing as struggling. 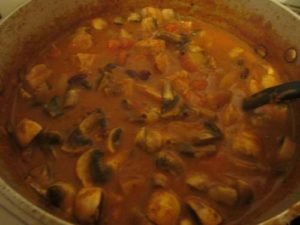 Also, here’s my pork and pumpkin stew, made for my Samhain meal with my guests. It was yummy! Update the lists as I go! I really got behind on my record keeping for this project. I’ve been making notes on my tracking sheet when I remember. I’m at day 45, so far as I can tell. I did the Lifebook Summit, and I’m counting that. 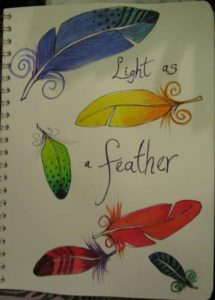 On the left is one of the guided activities, and since I love making feathers… there it is. Some things I just made notes about so I can do it when I’m puttering around with nothing specific to do. 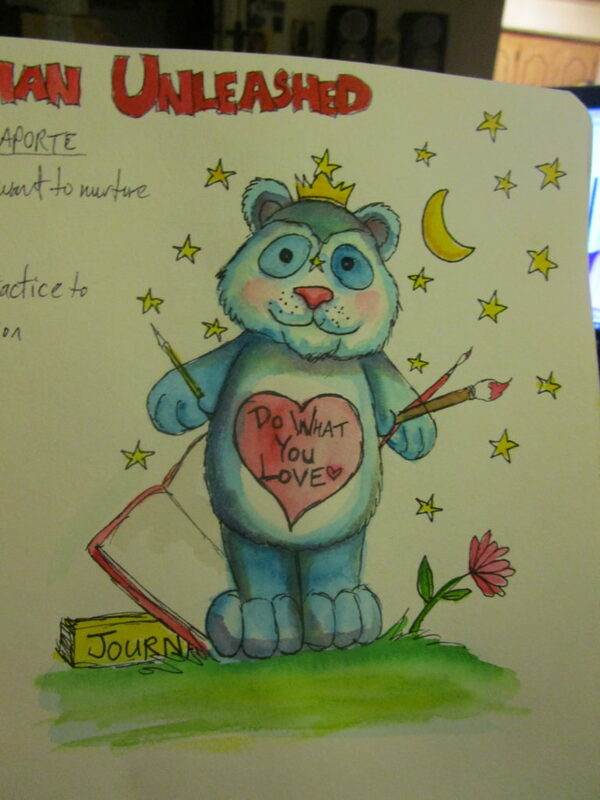 I also recorded a lot of quotes in my notebook, related to healing trauma through art and things like that. I’ve been working on that a lot lately, and I’ve come to the realization that healing is my part time job, and creating stepping stones to my own creative business is my other job. They are equal right now, because that’s what I need. I also did a LOT of stamping and die cutting for myself and as a gift to my mom’s friend. This is just an example picture of the stamping. Included are some tea dyed index cards that I stamped to include with pagan ephemera packs like the ones I showed previously. I really like the look. The pumpkin spice drinks in the bottom right are for a TN project I’m nearly finished. I just need to do some colouring and finishing up. The die cuts you see are for card making, for my mom’s friend. The ones in the pack in the background have been stamped with sentiments so that she doesn’t have to just cut them out from the white backgrounds I send otherwise. I think they’re nice, so I hope she finds them useful! I tried to make them in a lot of different colours to suit different projects. 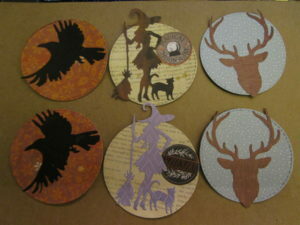 The stamping and die cutting shown here are just part of several days of each. 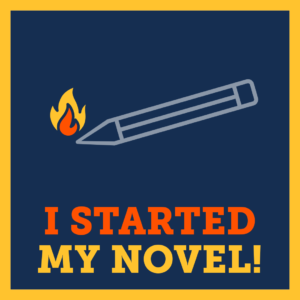 I did a couple days of intense writing in preparation for NaNoWriMo, and my novel (3rd in the Lupercalia: Sanctuary series), Black Dog. No photos of that. I just hung out at Tim’s and belted it out. I’ll post pictures of the renovation at some point. 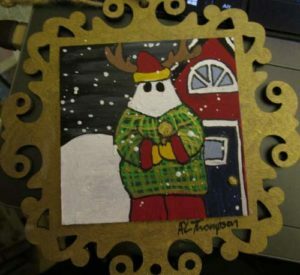 And the last thing I did lately is the mummer ornament for my mom’s Christmas gift. I have more things coming by mail, and more things hopefully to make, but I wanted to send this and other things out while Canada Post was having the free shipping special within Canada! She likes mummers, and I found the ornament at Dollarama, so BAM! I hung a cute red Christmas bell from the bottom, too. I’ll call this one Day 47. 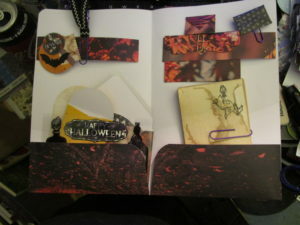 Days 21, 22, and 25: Pagan ephemera folders, made with beautiful autumn papers! 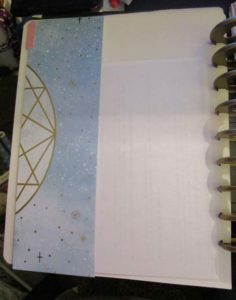 I don’t know which I like best, but I made a special trip to Michaels to look for this paper pad! I love it so hard! I think it’s called Autumn Dreams. Anyhow… let’s take a peek inside the folders. They’re the full 12 x 12 page, with a 2.5″ pocket inside, and a bellyband for attaching paperclips and such up top on each side. So I know it’s a bit hard to process what you’re looking at because there’s a lot. And I’m not even done yet! These are meant to be a basic BOS or journal embellishment kit, which you can expand on with the other packs I’m preparing too, like the woodsy pack in my previous post. 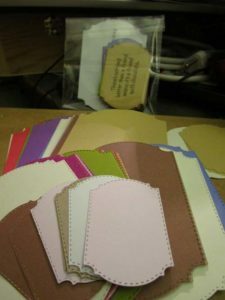 There are journal cards that I tea dyed and stamped on, envelopes, tags and labels, paperclips, stickers, and various die cuts. It took days to do all this, but I love it. I kinda want to keep them for myself. LOL Still working on these, because I have so many ideas! Day 23: I made circle tags today, which can be tuck spots, or attached to a paperclip. I haven’t decided yet. Need to distress the edges, I think. I bet you can tell these will be for more pagan packs. Day 24: I got back to my writing today! 2600 words starting off my 3rd Lupercalia: Sanctuary book, called Black Dog. Working out the twists as I go. So happy to be writing! 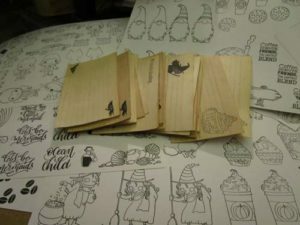 Day 26: I did a whole bunch of stamping and fussy cutting today, in preparation for other projects! I’m planning to do some TNs with various fandom themes, and you can see some witchy journal cards in the mix too. I watched Final Girl while messing with this. Interesting. I am currently OPEN for commissions.Click here for further details about Commissions.